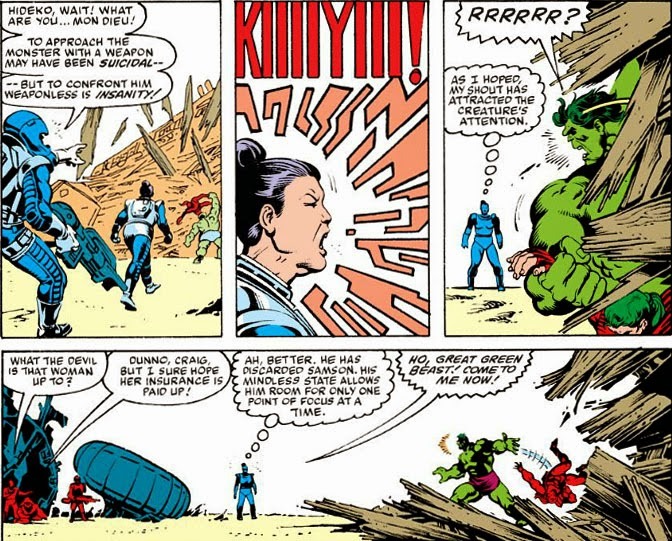 A member of Bruce Banner's cobbled-together Hulkbusters team, Hideko has been present as the Hulk, now free of Bruce Banner's influence, has all but decimated the 'busters and now uses the limp and unconscious body of Doc Samson as a bludgeon to demolish a desert town. And now, before a member of the team can attempt to invervene with a salvaged weapon, Hideko acts with a method more time-tested--aikido! Heh, "in time." Quite an optimist, Hideko. But the arrival of the Avengers makes her slim chance of survival moot. 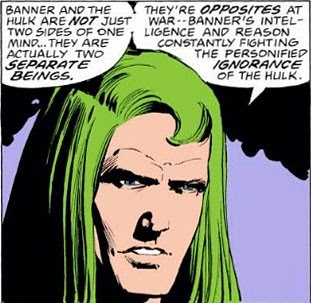 Yet, here at the crossroads, Banner--now having faced his demons (or, rather, "demon," in the form of his abusive father)--would realize that the rage within the Hulk is his own, with science having unleashed its destructive potential. And now he finds himself back at square one. As a man, he would be like any of us who had issues to work through--exploring the cause(s) behind them, putting them into perspective and finding a way to live with them. 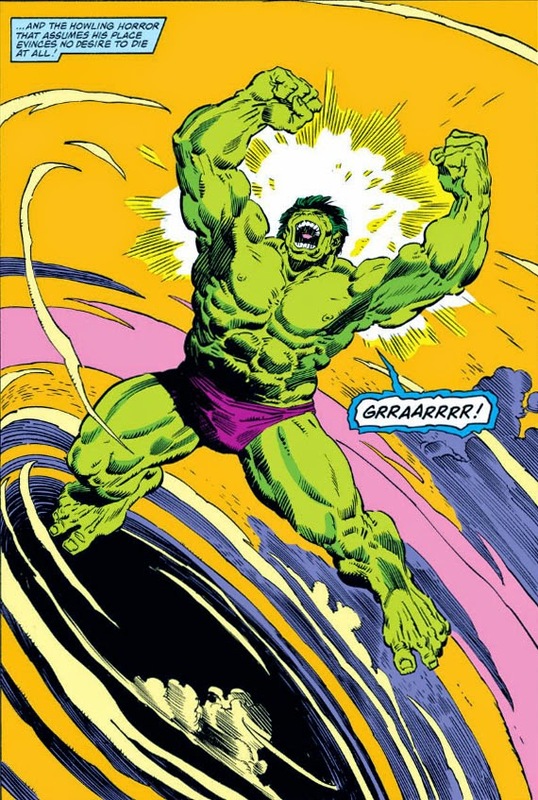 For the most part, we've now seen Banner do just that; but he is still the Hulk, and he is still apparently doomed to spend his life transforming into a creature who will unpredictably act out on that rage. 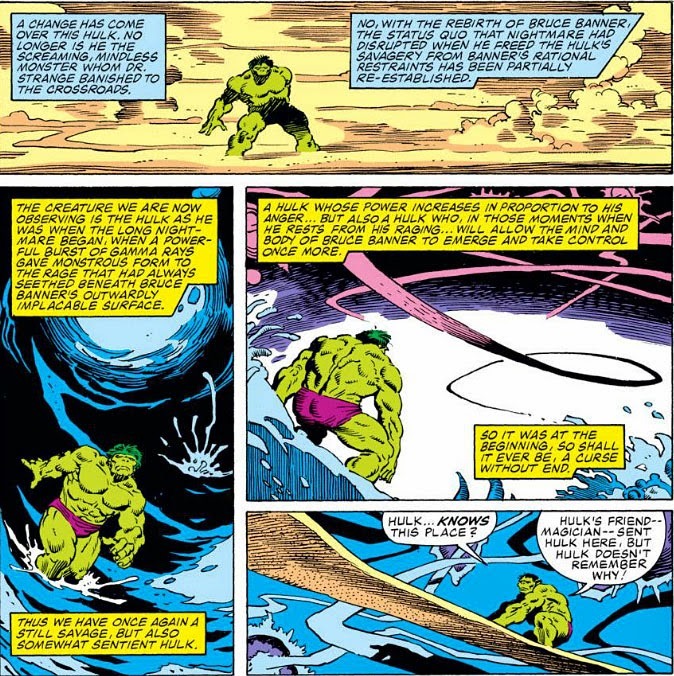 This would be writer Bill Mantlo's final story for the book--and it would serve not only to bring Banner full circle, but also to return the Hulk to his former state before Nightmare had tampered with him and suppressed Banner's unconscious influence. 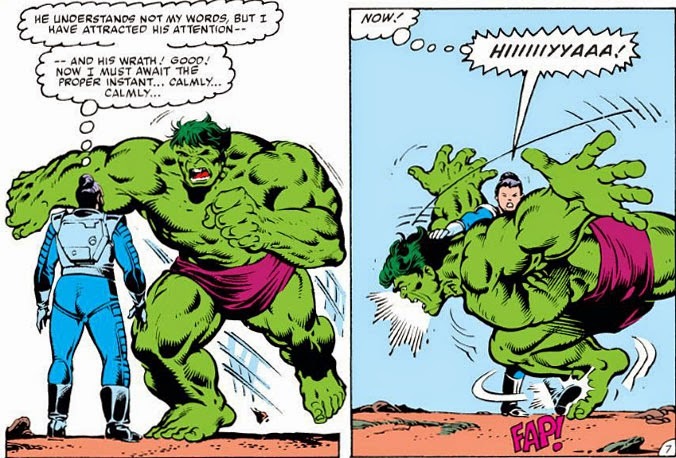 If you're thinking that Samson has perhaps done an about-face since that fight, in terms of his motivation to seek out the Hulk, you could be right. Maybe all it took was a second thrashing from the Hulk to get this guy to take a different direction in his life as "Doc Samson." 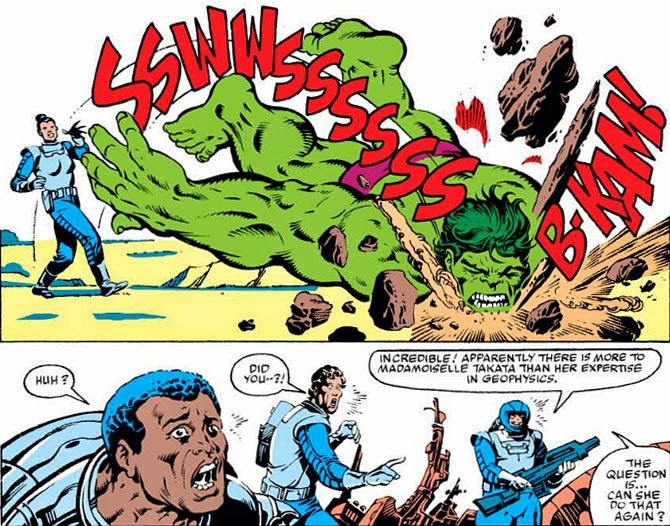 His goal this time around was originally to bring the Hulk back to base in order to have Bruce Banner there to assist in a procedure that would lead to the recovery of Glenn Talbot; yet, just as in their first battle, Samson's ego took over, choosing instead to regard his encounter with the Hulk as another opportunity to prove himself. And the proof, as they say, was in the pudding--or, in this case, the crater. 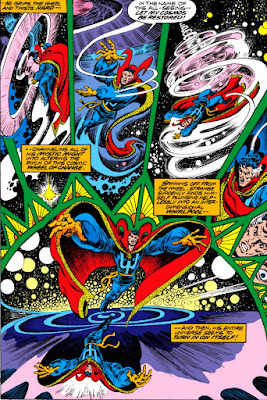 Regrettably, Sutton's tenure on Doctor Strange lasted for only eight issues, even with an accommodating bi-monthly publication schedule. To say that the book was in writer/artist flux during this time is an understatement, with Sutton at times inking his own work (and, even in one instance, another penciller)--so perhaps Sutton merely stepped aboard to lend an able hand. 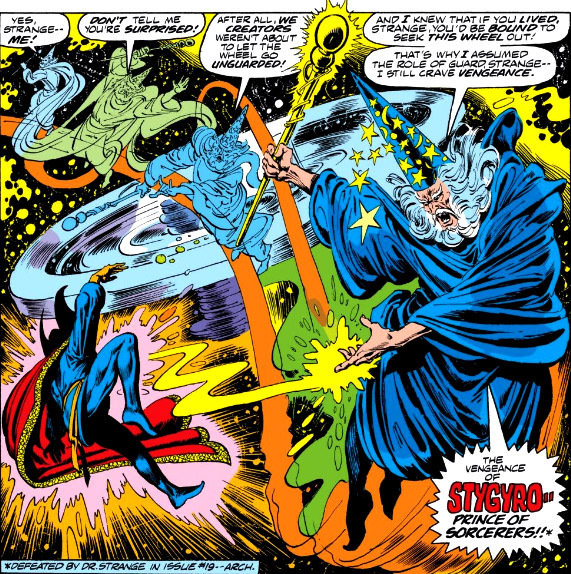 (A letters page response in one issue showed Marvel being unusually coy about whether Sutton was the new "regular" artist for the book, when normally they'd be welcoming that artist aboard with all due fanfare.) 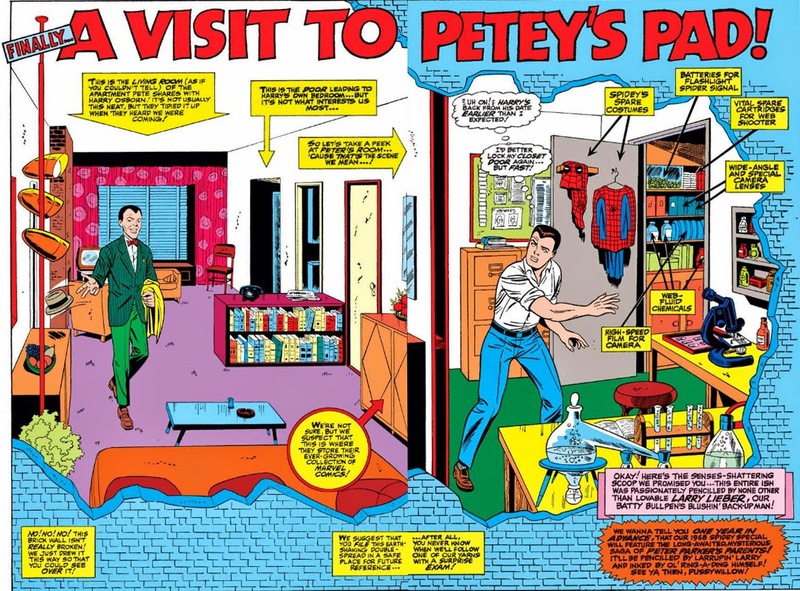 At any rate, the man unquestionably made his mark on this comic. How about some (mostly) double-page art today? 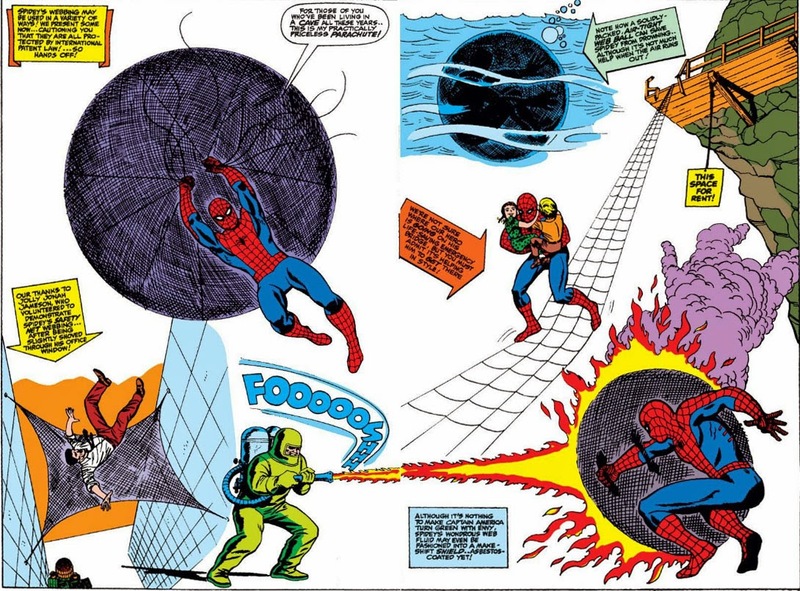 Let's go back to the late 1967 Amazing Spider-Man Annual, where we find its back pages crammed with all sorts of Spidey trivia. 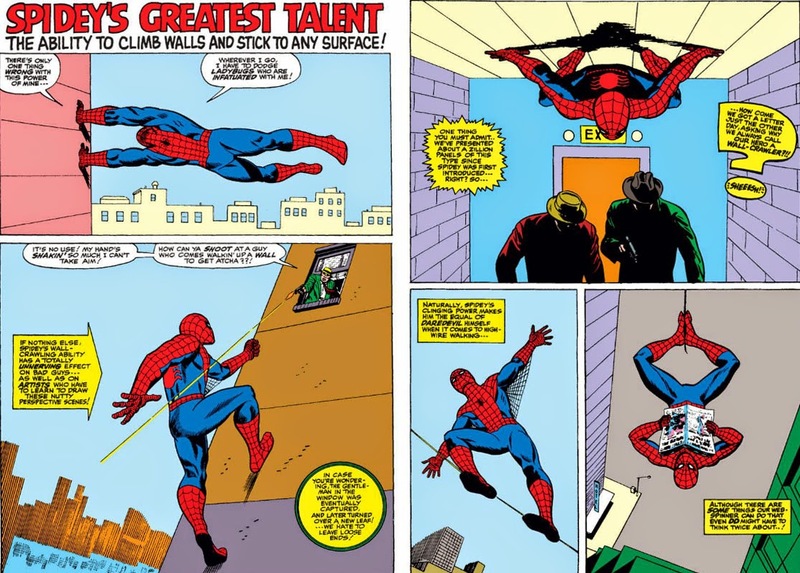 We never see that web parachute much anymore, do we? 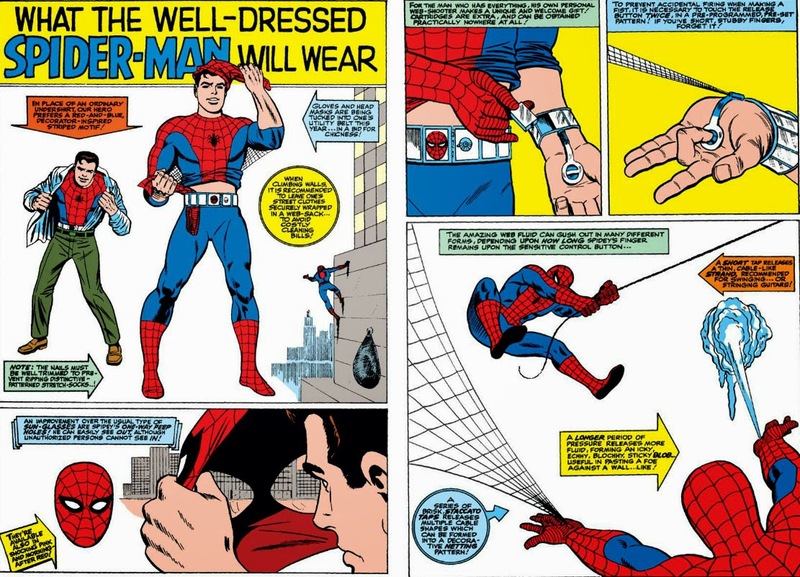 Not even in situations when we're all crying out, "Hey, use your web parachute, dope!" 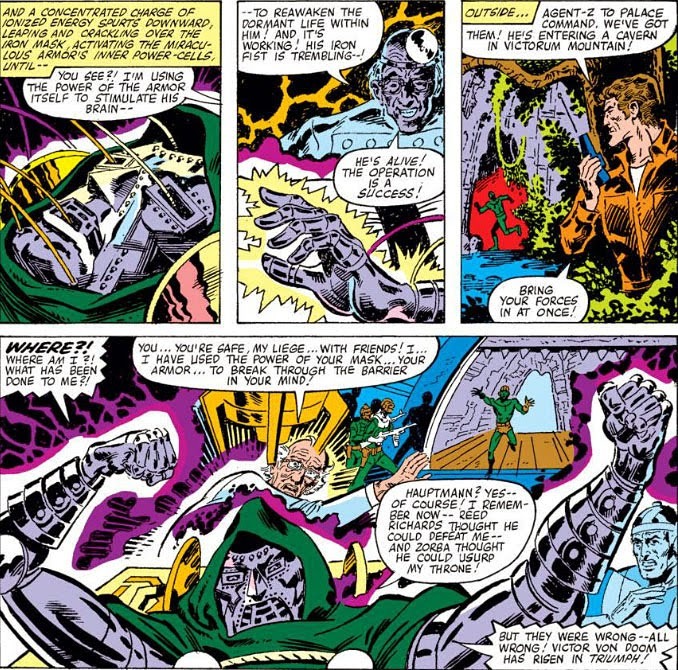 The fortunes of Victor Von Doom had certainly changed, once his scheme to install his "son" on the throne of Latveria had backfired in Fantastic Four #199. 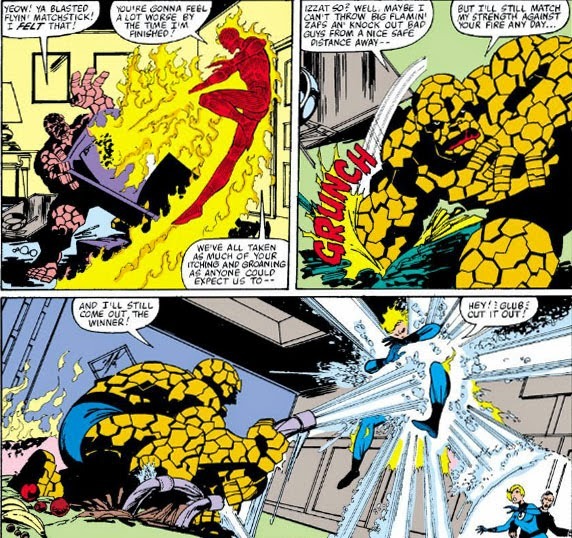 Soon after, in the FF's landmark 200th issue, his bid to take control of the delegates of the United Nations would also meet with failure--and his nemesis from the Fantastic Four, Reed Richards (a/k/a Mister Fantastic), would triumph over him in pitched battle, rendering Doom catatonic in the process. 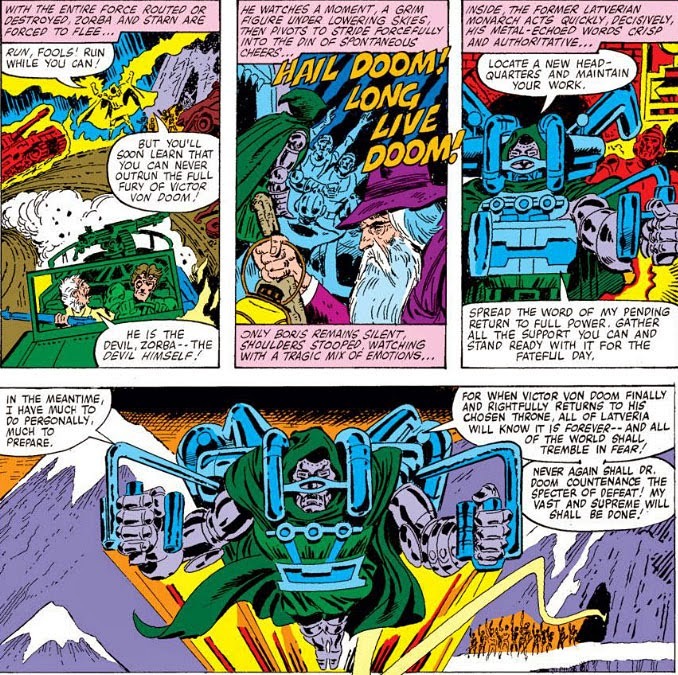 Effectively deposed, Doom was eventually succeeded on the throne by Zorba, the heir to former King Rudolfo--and Latveria took her place at last as a free nation. 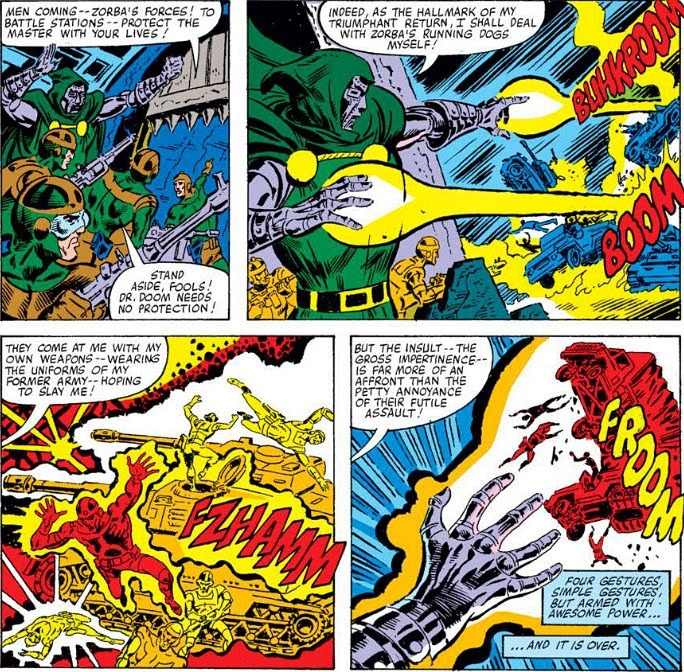 It's hard to imagine Doom ever suffering a more devastating defeat. How would he possibly recover from this--even if his mind were still functional? It's then that Zorba's troops arrive--but they find that their opposition needs no army to brutally deal with them. 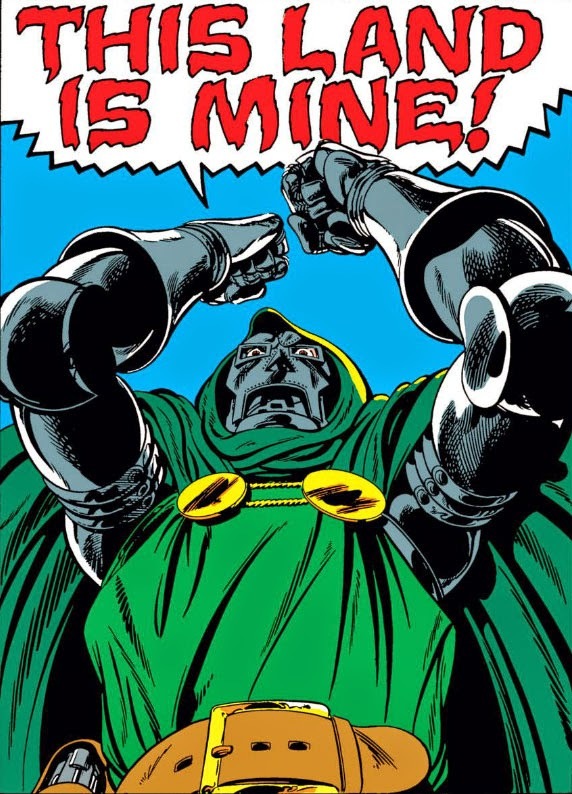 Doom lives--and there was little doubt from anyone, perhaps even Zorba, that the day would come when he would rule Latveria again. 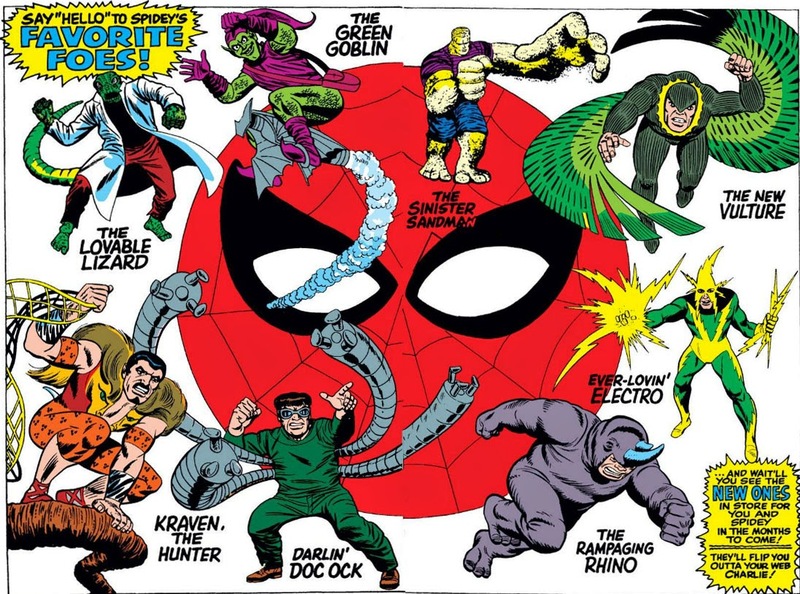 Forty-two years ago to the month, two now-famous names at Marvel Comics were just getting their start with the company. 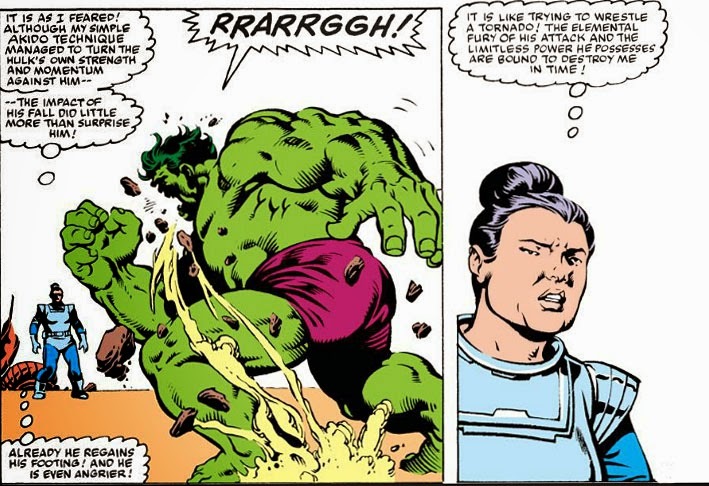 And thanks to a couple of name-dropping responses on a letters page from the Incredible Hulk comic published that month, we get a little bit of first-hand history about them. 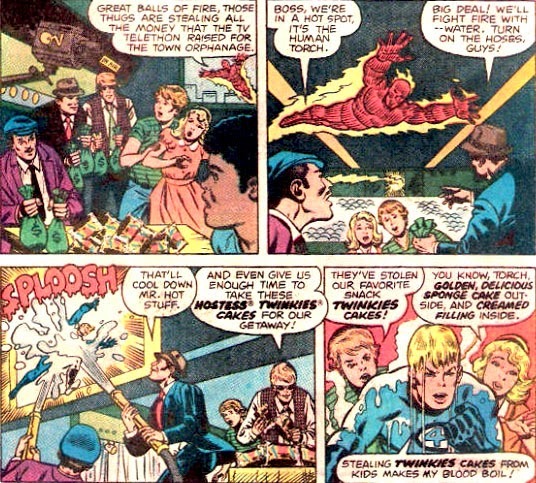 Also, I seem to recall a letter response a few years later where another writer had also suggested colorists receive credit along with other story contributors, with the response indicating what a great idea it was--and a few months later, colorists indeed began being so credited. 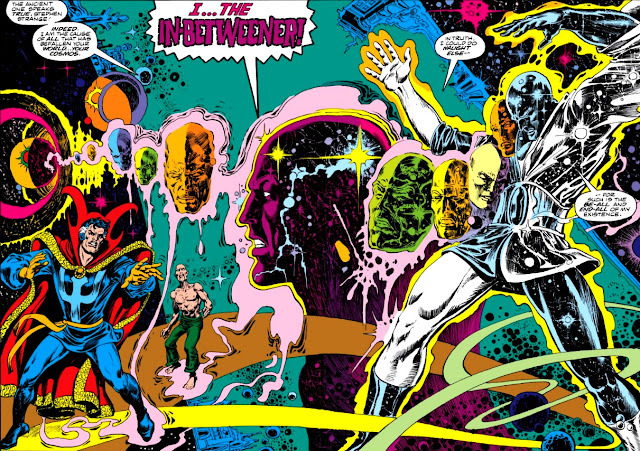 I'm glad the "complications" mentioned were eventually resolved--the contribution of a colorist to a comic book is certainly worthy of recognition. 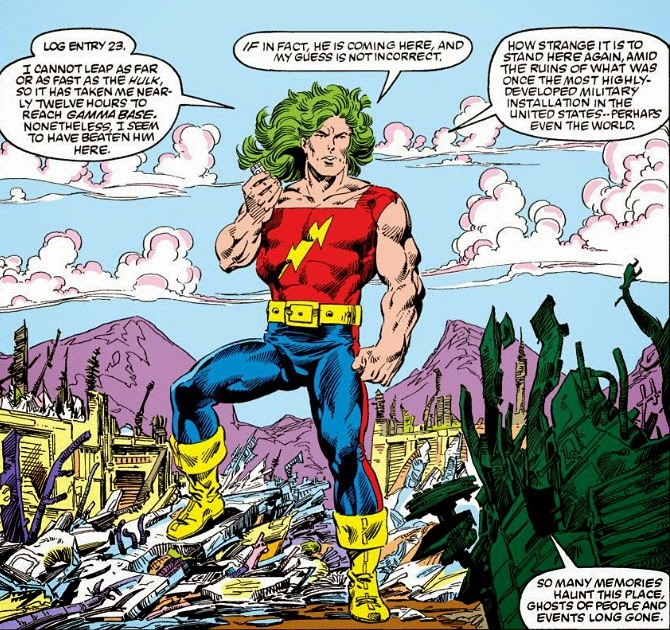 From a reader's perspective, it's difficult to see the creation of the "Doc Samson" character as little more than a flashy novelty in terms of a new character to go up against the Hulk. 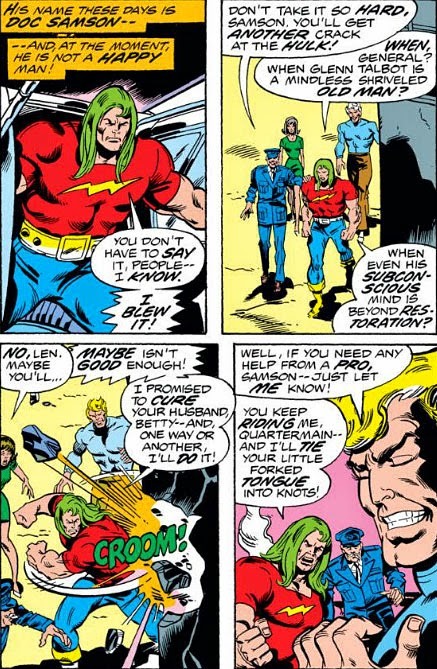 Yet it's to writer Roy Thomas's credit that Samson's origin at least seeks to add some level of depth to what could easily have been a one-shot appearance; in fact, his origin may arguably be the one thing about Leonard Samson that justifies the effort to improve on him. 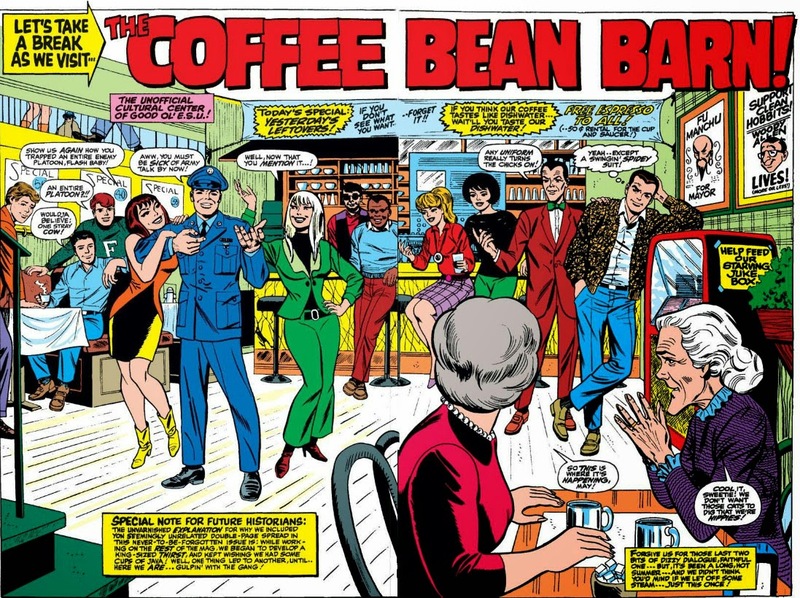 For there's really no reason why Leonard Samson would merit a place in the Hulk's "rogues' gallery," were it not for the fact that Samson had an unconscious yet driving desire to be more than he was. 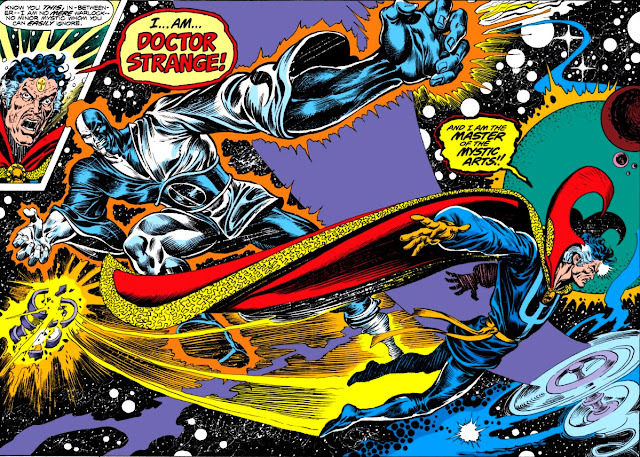 I haven't kept up with Samson, but the last I knew he had struck a balance between his professional occupation and his super-strong alter ego--a psychiatrist who maintains his contacts with the military and changes into his "fighting togs," as he puts it, when the need arises. 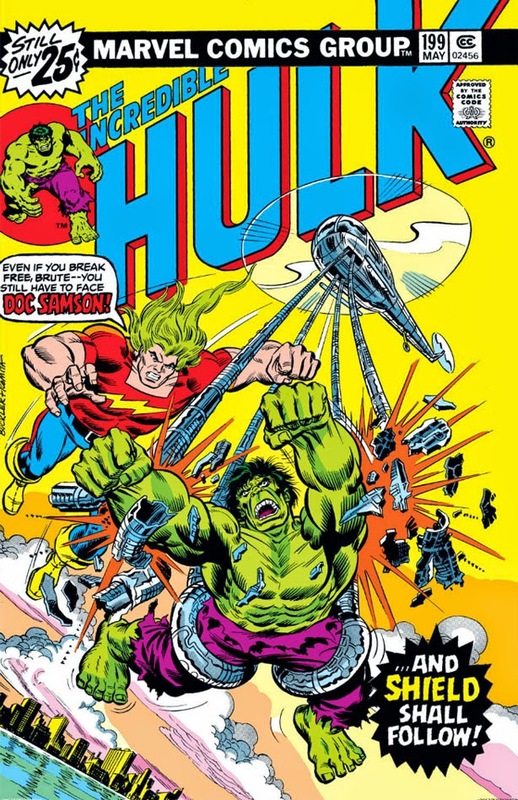 Given his almost obsessive need to prove himself in the beginning of his super-hero career, it was only natural that he would eventually establish a more stable direction for his life; but, while I've always had apathy for Samson to some degree, it was those appearances in his earlier dealings with the Hulk (and with Bruce Banner) that I found more interesting. Because while Samson may have reached out to establish contact with General Ross with the best of intentions, there was an ulterior motive at work that even he wasn't prepared to admit. In a way, he was a psychiatrist who didn't know his own mind--at least, not yet. 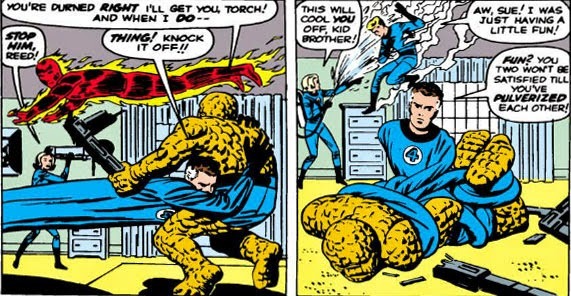 It's a running joke in any discussion of the Fantastic Four, to be sure: The Invisible Girl, captured by whoever was out to get the FF, and held hostage for leverage over the three men of the group. The "joke," of course, was that it seemed to happen a lot, and always to the female member--taken out of action all too easily despite her powers. 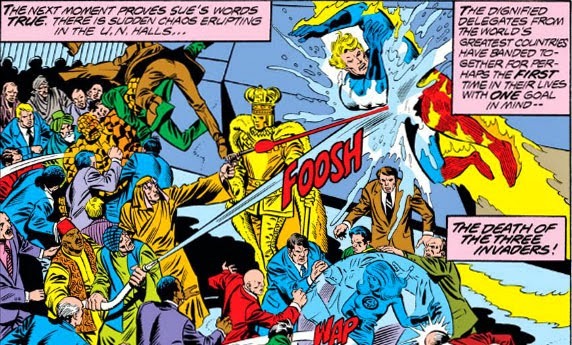 Did the bad guys target Sue just because she was female? Or because they figured she was the least likely of the four to put up a fight? Or because they thought she wouldn't really be able to defend herself? Take your pick. Perhaps it's all of the above. 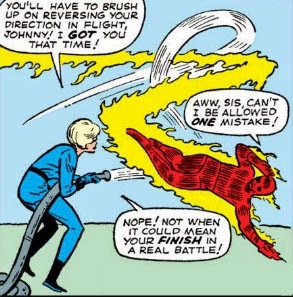 But it's high time we took an actual count of the times that Sue's been whisked away by a foe. Fortunately, Barbara had already done the leg work and was delighted to provide us with the data. I hear she's putting together a scathing documentary on the subject. Just how often was the Invisible Girl captured and held hostage? I think one of the first stories where I became familiar with the art of Neal Adams (if not the first story) was X-Men #63, which had made its way to a back issue stack in an old bookstore. I picked it up on a whim, but when I got it home it turned out to be quite a find. The issue was of course part of Adams's celebrated run on the title, though I didn't realize at the time that the cancellation of X-Men was just around the corner from this story. 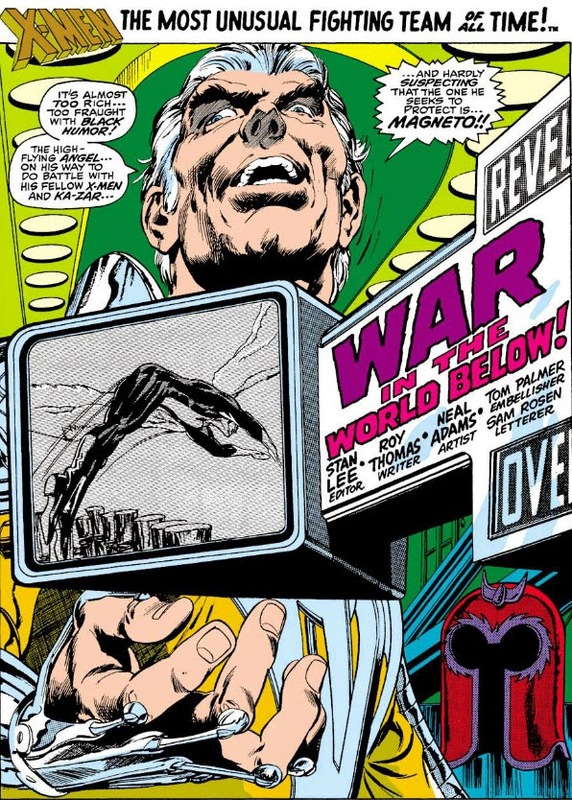 I hadn't been a reader of X-Men during its original run, and I can't say that "War In The World Below!" made me regret that to any degree. 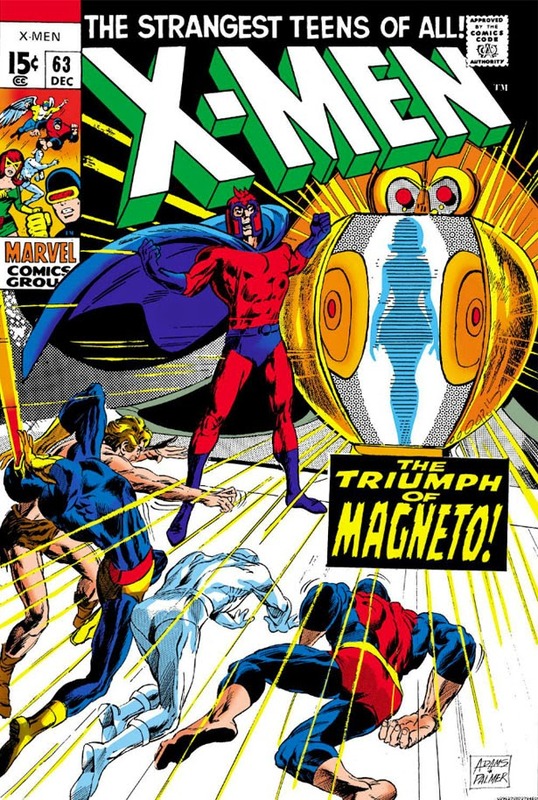 Writer Roy Thomas would find his niche on other titles, but the original X-Men team would prove daunting to not only Thomas but to many other creative talents at Marvel as far as having the team strike a chord with readers. 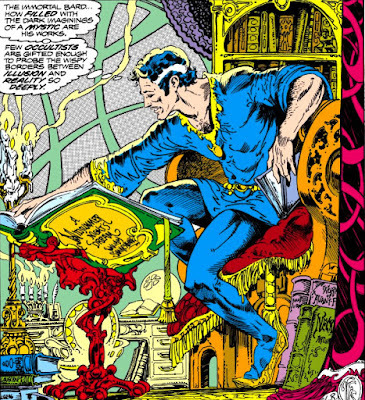 With Adams's pencils, you always had the feeling you were looking at a splendid story--but try as the writing might, the X-Men themselves would fall short of hooking you and reeling you in. 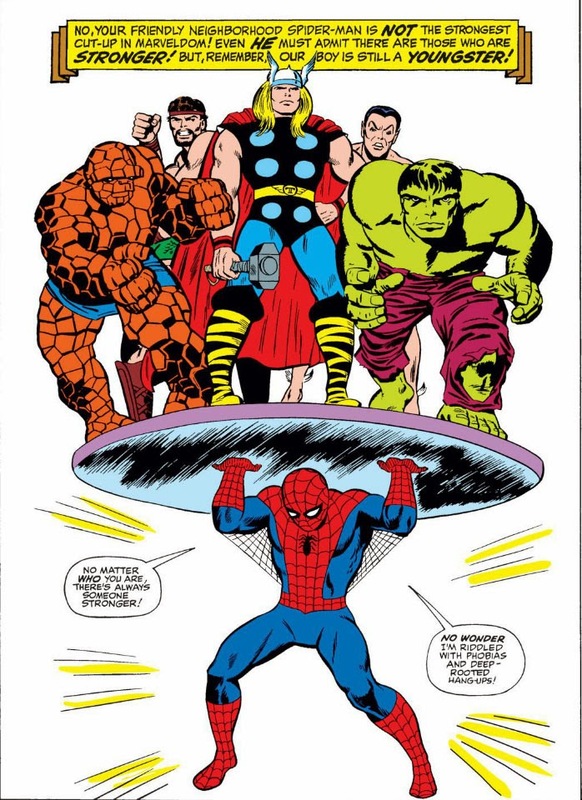 There were other books I recall (e.g., Ms. Marvel, Nova, even Sub-Mariner) where I would find that to be true--but with X-Men, it was always a head-scratcher why this team just didn't click. It just seemed they should. 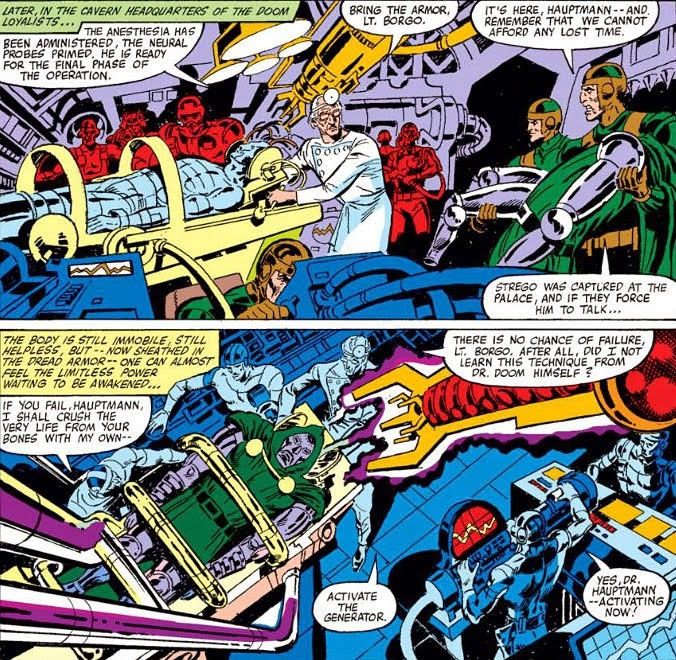 By this point, the title was well past the death of Charles Xavier, and the team for all intents and purposes was operating on its own. 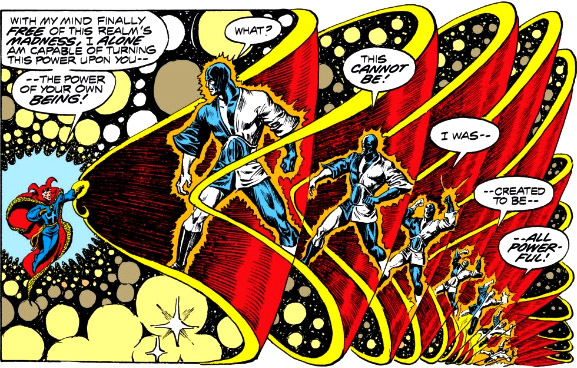 It wasn't a bad experiment to try--removing them from the direction and safety net of Xavier and making the the X-Men stand on their own, in a kind of "sink or swim" gambit. Now with just three issues to go before the title's cancellation, this story will give you an idea of how incoherent the team still comes across, even after twenty issues of its members operating on their own. 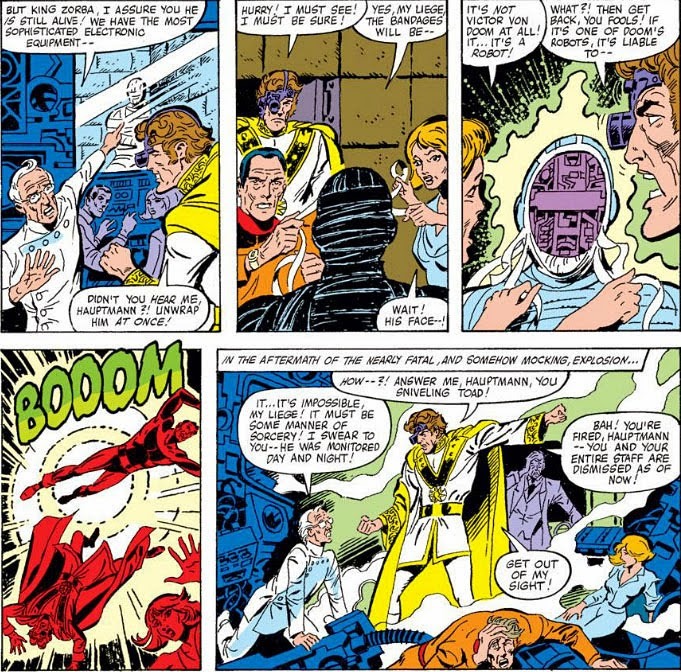 All of the individual members of the X-Men are certainly characters within their own right--but there is no direction here, no thought as to where they might head as a team, or why they are a team. So, where do we find the X-Men in this story? In the Savage Land, where the Angel has accidentally ended up and where the other X-Men have come in search of him. 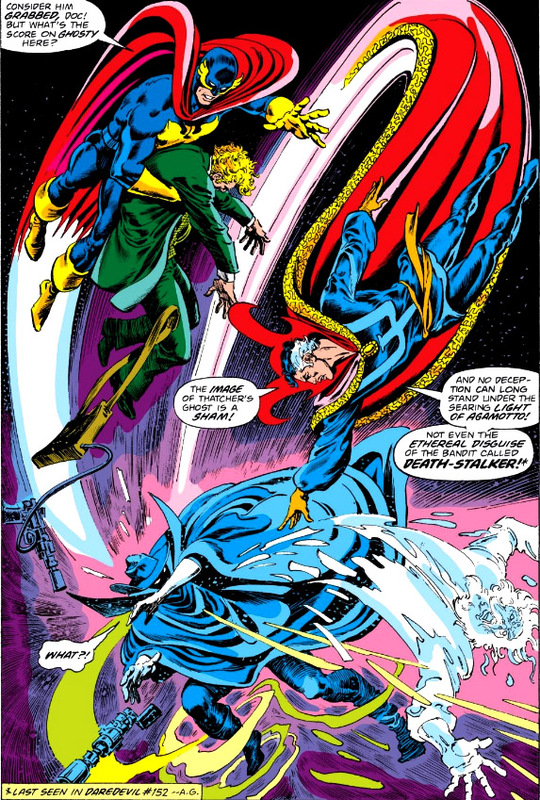 (An improbable set of circumstances which gives you a good idea how, with no real self-direction on the part of the X-Men, the burden must fall on the story to choose one for them.) With injuries sustained from an attack of pteranodons, the near-death Angel is found by a man known as "the Creator," and taken to his lab to receive treatment. 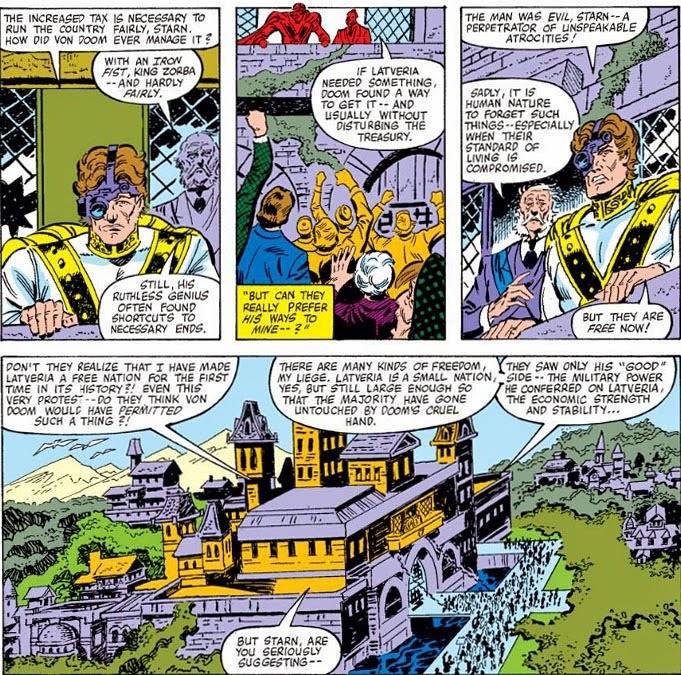 There he learns that the Creator is something of a Savage Land Xavier--locating mutants in this environment and teaching them how to use their powers. 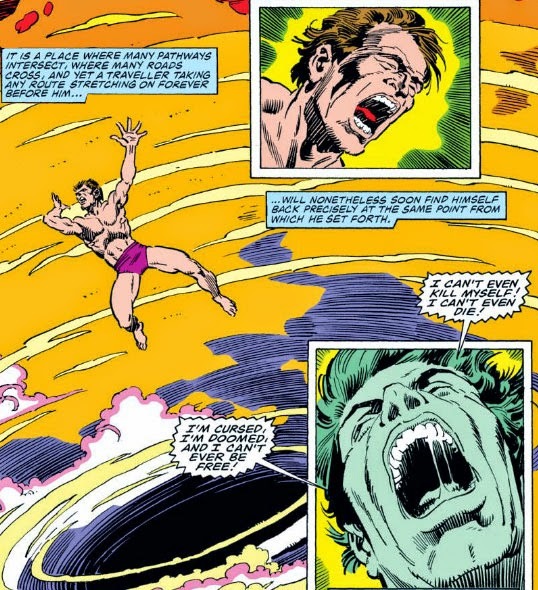 But his operation has put him at odds with Ka-Zar, who ostensibly rules the Savage Land, and whom the Angel learns the other X-Men have allied themselves with. 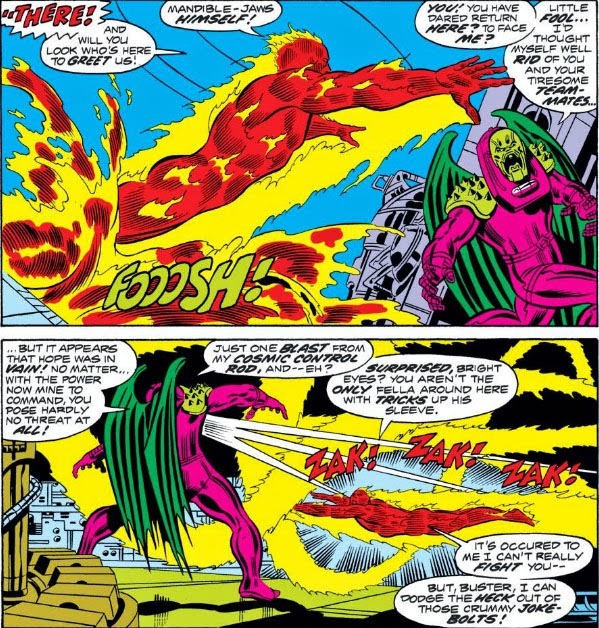 Annihilus, Annihilus. Tsk tsk. There's such a thing as too quick an attack. If only you'd had something a little more ponderous and humiliating, like... a fire hose. You could even have it built into your costume. You'll find it very, eh, handy! See? Even when the Torch knows what you're up to, you still have time to hose him. If you don't want to go the fire hose route, you can get by with a simple extinguisher apparatus. 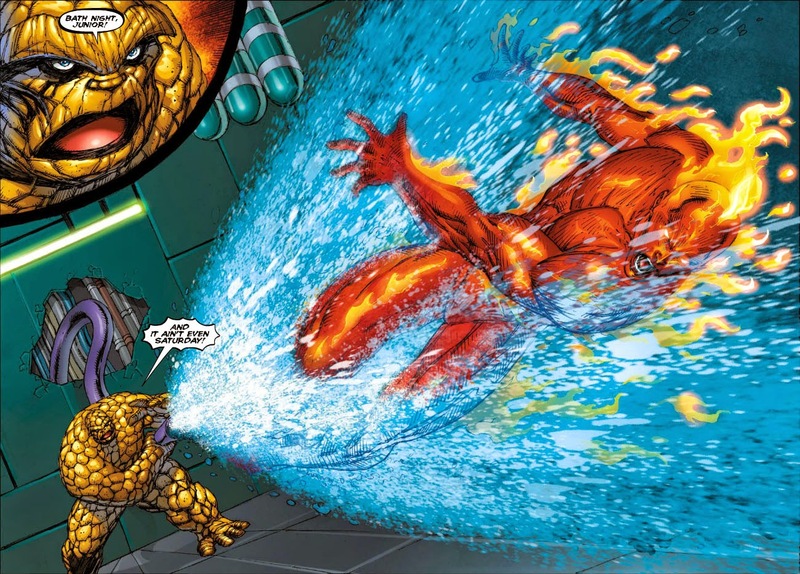 You can even say something villainous, like "Prepare to be extinguished, Torch!" Whoops. Looks like it's time for a word from our sponsor.